Earlier today, the United States Mint began sales of the 2011 Presidential $1 Coin Uncirculated Set. This is an eight coin set, which includes each of this year’s Presidential Dollars struck at the Philadelphia and Denver Mints. The Presidential Dollars Program honors the former Presidents of the United States in the order served. Each year since 2007, four Presidents have been featured on the obverse design of the circulating $1 coin series. The reverse of each coin features a depiction of the Statue of Liberty. This year’s releases feature the 17th to 20th Presidents of the United States, Andrew Johnson, Ulysses S. Grant, Rutherford B. Hayes, and James Garfield. 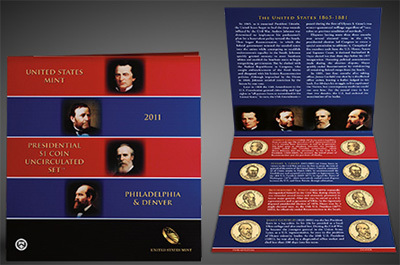 Coins included in the 2011 Presidential Dollars Uncirculated Set are mounted in individual, rotatable blister within an illustrated folder. Brief biographical sketches and portraits of each President are included. The sets are priced at $19.95 each. The official start of sales was April 27, 2011 at 12:00 Noon ET. There are no stated maximum production levels or household limits for this product. At this time, the 2010-dated set also remains available for sale priced at $18.95 each. This is a set that the mint should of continued the satin finish to keep continuity and make it a worthwhile rarity but to me $19.95 for unc $8.00 dollar coins does not make cent$.